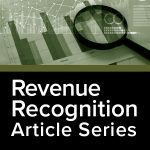 The purpose of this article is to provide an overview regarding disclosure requirements of the FASB Accounting Standards Codification – Topic 606, Revenue from Contracts with Customers (ASC 606). ASC 606 contains significant disclosure requirements. The objective of the disclosure requirements is for an entity to disclose sufficient information to enable users of the financial statements to understand the nature, amount, timing, and uncertainty of revenue and cash flows arising from contracts with customers. The new standard requires entities to disclose both qualitative and quantitative information. Expanded disclosure requirements will be needed for the majority of small and mid-sized businesses affected by the new standard. [i] Per ASC 606-10-50-7, if an entity elects not to provide those disclosures the entity should, at a minimum, disclose revenue disaggregated according to the timing of transfer of goods or services (e.g., goods transferred at a point in time and services transferred over time) and qualitative information about how economic factors (such as type of customer, geographic location of customers, and type of contract) affect the nature, amount, timing and uncertainty of revenue and cash flows. The Company reports the following sales segments: Supplies, Equipment, Maintenance. The Company disaggregates revenue from contracts with customers by geographical area, major product or service lines, and timing of revenue recognition which depict how the nature, amount, timing, and uncertainty of revenue and cash flows are affected by economic factors. ASC 606 requires disclosure of the aggregate amount of the transaction price allocated to the performance obligations that are unsatisfied at the end of the reporting period and an explanation of when the entity expects to recognize revenue by either a quantitative basis or a qualitative basis. The Entity generates revenue primarily by delivering supplies, manufacturing and installing equipment, and performance of maintenance contracts with customers. Revenues from the sale of supplies and equipment are recognized when the supplies or equipment are transferred to the customer, the customer obtains control of the product (risk of loss passes to the customer), no significant obligations remain, and return and warranty liabilities can be reasonably estimated. Progress billings and upfront payments received as part of a contract to manufacture equipment are deferred until control of the equipment transfers to the customer based on contract terms. Revenue is recognized from the performance of maintenance services when the services have been provided or delivered. Furthermore, revenue from performance of maintenance services are recognized only if the collectability is likely and the fees charged are determinable. Sales of products and services are evaluated in order to recognize revenue based on the net amount earned as revenue. For multi-element contracts, including the sale of equipment and installation, we allocate revenue to each component based on each component’s relative selling price. As summarized above, the new revenue standard vastly expands disclosure requirements related to contracts with customers. The implementation of the new requirement will require careful consideration and significant judgment, and, while the standard provided a number of practical expedients for non-public entities in the application of the recognition and measurement principles within the standard, management should still anticipate devoting substantial amount of time and resources to meeting these disclosure requirements.